THE LEGEND OF TANK GIRL! Pre-order NOW! "The collection of Alan Martin and Brett Parson's latest all-new Tank Girl series! 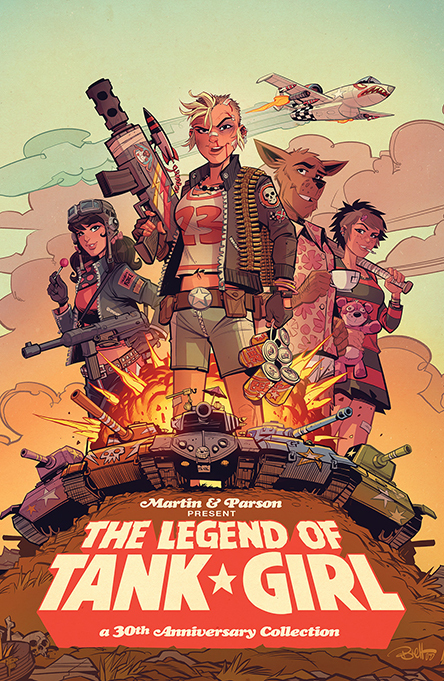 Between 2016 and 2017, Tank Girl co-creator Alan Martin and artist extraordinaire Brett Parson produced a trilogy of graphic novels - "Two Girls One Tank," "Tank Girl Gold," and "World War Tank Girl" - these three books comprise the longest continuous Tank Girl story arc to date, involving copious amounts of spilt blood, the resurrection of long-dead characters, a train-full of gold bullion, and gallons of fine tea. Each series was met with ecstatic fan approval and universal critical acclaim. Now we are bringing that epic story together into one, single, coffee-table-busting tome! Printed in an over-sized format to better appreciate the beautiful full-colour artwork, packed with dozens of guest artist covers, unseen artwork, and character and vehicle sketches, this is the trilogy as you've never seen it before!" Pre-order online (forbidden Planet, amazon etc.) or from all good comic and book stores.